Definition at line 2181 of file lscript_tree.h. Definition at line 2184 of file lscript_tree.h. Definition at line 2191 of file lscript_tree.h. Definition at line 9501 of file lscript_tree.cpp. Definition at line 9533 of file lscript_tree.cpp. 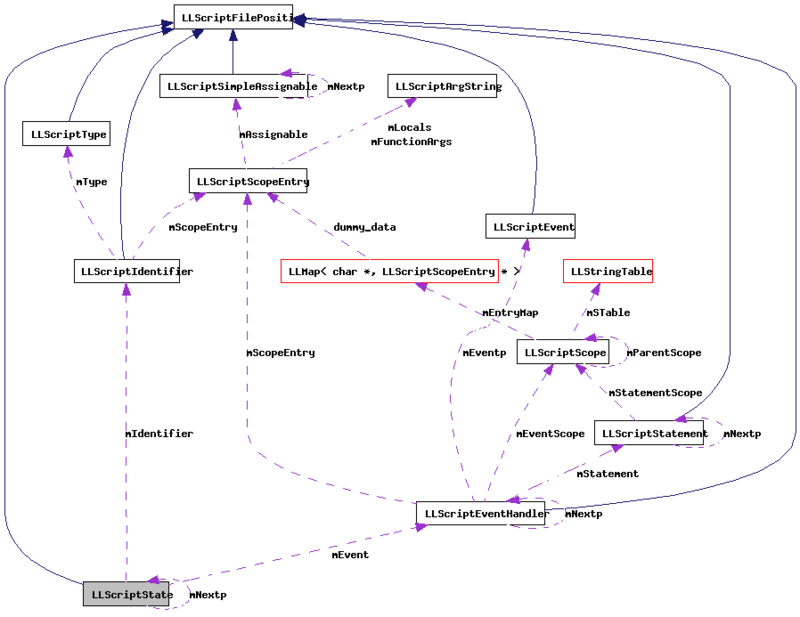 Definition at line 9510 of file lscript_tree.cpp. Definition at line 9538 of file lscript_tree.cpp. References LLScriptByteCodeChunk::addBytes(), LLScriptScope::addEntry(), LLScriptScope::checkEntry(), FALSE, LLScriptFilePosition::fdotabs(), gCurrentHandler, gErrorToText, get_number_of_event_handlers(), LLScriptGenerateErrorText::getErrors(), gonext(), integer2bytestream(), LIT_STATE, LSCP_DETERMINE_HANDLERS, LSCP_EMIT_ASSEMBLY, LSCP_EMIT_BYTE_CODE, LSCP_EMIT_CIL_ASSEMBLY, LSCP_PRETTY_PRINT, LSCP_SCOPE_PASS1, LSCP_SCOPE_PASS2, LSCP_TYPE, LSCRIPTDataSize, LSERROR_DUPLICATE_NAME, LSL2_CURRENT_MAJOR_VERSION, LSL2_MAJOR_VERSION_TWO, LSSTYPE_DEFAULT, LST_INTEGER, LST_NULL, LLScriptByteCodeChunk::mCodeChunk, LLScriptScopeEntry::mCount, LLScriptByteCodeChunk::mCurrentOffset, mEvent, mIdentifier, LLScriptIdentifier::mName, LLScriptIdentifier::mScopeEntry, mType, NULL, LLScriptEventHandler::recurse(), LLScriptIdentifier::recurse(), S32, u642bytestream(), and LLScriptGenerateErrorText::writeError(). Definition at line 2202 of file lscript_tree.h. Definition at line 2201 of file lscript_tree.h. Definition at line 2203 of file lscript_tree.h. Referenced by addState(), and gonext(). Definition at line 2200 of file lscript_tree.h.